While the members of the investigation team are spread out across the province, the majority of us are from Colchester County and the town of Truro. I grew up about a half an hour away from town, and moved here when I returned to Nova Scotia in 2006. There is definitely no shortage of haunted homes, businesses and areas in Truro and throughout the outskirts of town. One of the first public events that we held was at the Colchester Historeum, and we have held investigations and events there over the years ever since. Along with the museum, we have investigated a dozen other homes and places of business in Truro, walking away from most of them with evidence of a haunting. When a friend contacted us wanting an investigation, we were instantly intrigued as he told us his story. He had purchased a home downtown and began renovating it as soon as he moved in. One of the first renovations that he did was in the kitchen, and over the span of a couple of weeks as the work continued, he started noticing and hearing odd things in the house. Over time his girlfriend began to notice different things as well. While this was being recorded, we also had a DSLR camera set up in the room recording both video and audio. Sometimes our cameras will pick up audio that the digital recorders don’t capture. In the video you will see Darcy and myself conducting EVP sessions. At the seventeen second mark you can hear a male voice say ‘and you’ to Darcy explaining that our equipment is to communicate with them. We recommend headphones when viewing and listening. After asking if what he’s talking to recognizes him, at 0:30 a voice clearly says the name ‘Lisa’, who is Darcy’s wife and has been with him to the house before. We also had a device called a REM pod set up that detects electromagnetic energy and static energy, both of which people and spirits give off. The device emits a noise when the energy levels around it are climbing. At 0:40 the device goes off after Darcy asks the spirit to move towards the device and touch it if they can. At the time we didn’t think the REM was going off, as the lights stayed unlit. During editing however we saw that what we were hearing was the sensor on the REM going off. We recommend using headphones while watching the clip. A few days after we left the house the owners contacted us again to send a photograph that they had found with no explanation of who took the photo. In the frame is a short hallway that leads from the kitchen to the living room area. The door that is open in the photo is always kept shut. They didn’t take the photo, and can’t explain why the door is open like that. The noises have continued as well as the family occasionally feeling off in the house. This is a location that we will come back to, as we did get evidence in the house, and it is local to team members. 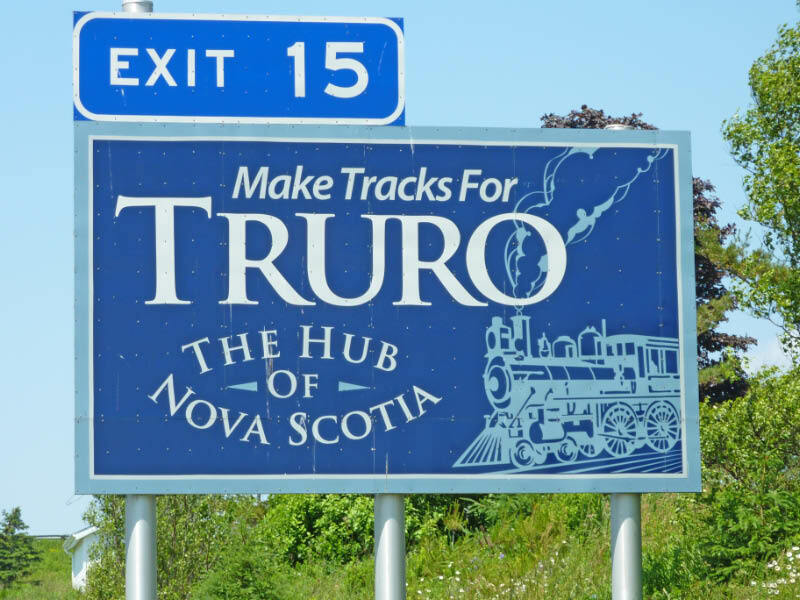 There are several other Truro locations that we are looking forward to getting to in November, so check back with us! Catherines Grave Investigation - Thorburn Exchange, Pictou County N.S. 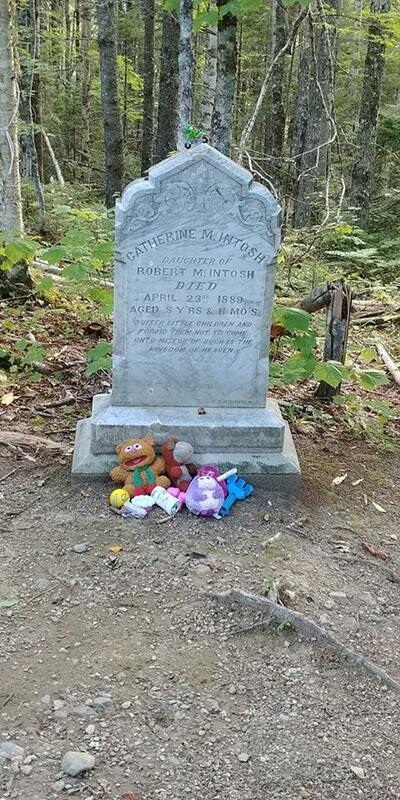 Catherine's grave is one of those locations that you encounter every time you google haunted locations in Nova Scotia. It's located in Thorburn Exchange, just outside of New Glasgow. The drive takes you along highway 102 and then through a very scenic and pretty drive along a secondary highway. You will turn onto a small winding dirt road that is named the Greenvale road before arriving at her grave. It is worthy to note that you will not likely have any cell signal here. Her grave is set in a few meters from the road, and there is usually an abundance of toys left as gifts for her from people who visit the site. One of the myths is that if you don't leave her a toy, she will become angry and make her presence known. Some people have reported small child sized handprints in the dust on their car when they got home. Other people have commented that they have heard growling when they were there, felt watched, and felt like something was following them when they left the area. Members of our team recently investigated, and we recorded several very interesting class A EVP and ITC clips while we were there. It's definitely a location we will visit again, and recommend to any other teams or individuals looking for locations to check out! The video below is a rough cut of our investigations evidence, because the video has no captions I will add what we think we hear below the video - let us know if you hear anything or see anything that we missed! At 0:22 we hear 'ten' and at 0:37 'yes'. At 1:02 we hear 'toys' or 'boys'. At 1:45 we hear a male voice say 'back' as if he was agreeing with Darcy. At 2:15 we hear a very clear EVP of a male voice say 'don't' directly after Laura mentions taking toys. At 2:39 you can see both girls feel something behind them in the woods. At 3:35 we hear what sounds like a growl And at 4:10 the toy falls, although that might have been from Darcy moving away from the stone. Feel free to share, leave a comment, and check back for upcoming events and investigations! During the evening of April 23, the members of Paranormal Investigations Nova Scotia hosted an investigation for 20+ members of the museum staff and public to spend the early hours of the evening investigating this historic and haunted building using all of our equipment. During these events members of P.I.N.S. are there to provide information and guidance on using the equipment. We have investigated the museum for three years now, and always record evidence when we are here, which is one reason why it is such an excellent choice for events. Our team arrived at the museum at 6:30 PM and began to set up our equipment as well as chairs for guests to sit at during the orientation portion of the event. The guests began arriving shortly before 7:00 PM, and were greeted at the door by members of P.I.N.S. as well as staff members at the museum. Once all of our members had arrived, the curator of the museum as well as another long time employee of the museum went into detail about the buildings history as well as the paranormal history attached to the museum. This is a building that has had ghost stories circulating about it for decades, from employees of the Historeum to members of the community and town. Following Margaret's speech, I went into a little detail on the experiences and evidence that our group has experienced and recorded over the last three years. We are constantly recording the same names as well as voices during each visit here. We also hear and record the sound of young children laughing and playing in the basement each time we investigate the museum. The activity is generally always in the same areas of the building. For the most part the active areas are the top floor as well as the archives section, and one area of the basement always seems to have activity happening in it. Over the years I have been told many stories by community members and members of Haunted Nova Scotia that they have seen shadows moving in the basement at night when they were walking by on the sidewalk. Some people have also told me that they have seen figures standing in the basement, appearing to look out at them. One area of the basement is especially creepy when you walk into it for the first time, as it has mannequins as well as spare body parts for mannequins in boxes along each wall. When my group was in the basement investigating I walked towards this room while recording video on a full spectrum camcorder. While I was in the room I heard rustling and shifting noises, and so did another member of the event. Later that evening the group that was investigating with Heather and Amanda saw movement in that room, and also heard the sound of children laughing. In the video below there is a sample of the mannequin room to give you an idea of why it is a little creepy at that end of the basement. During this event the same names were recorded that we have gotten on our audio and video feeds in the past. Two of the male names are Michael and Bob, and they are for the most part recorded in the archives section of the building. The archives room is quite small and has an amazing collection of the history of Colchester county as well as one of the well known ghost stories attached to the building. Decades ago a worker was outside the windows of the archives room when he looked up and was startled to see a woman in older period clothing on the other side of the window, staring directly at him. The worker slipped and would have fallen if he wasn't wearing fall prevention equipment. Rushing into the building after climbing down from his work platform he was amazed to see that the window he had seen the figure in was covered over with paper. Even if there was a woman in the room watching him, there was no way that he could have seen her. Darcy and Heather in the archives room conducting an EVP session and recording video with a thermal video camera. Along with children's voices being heard in the basement during this event (and at previous events as well) we also recorded a positive answer indicating that there were the spirits of children in the museum. When we recorded the video listed below we were on the main floor level of the building, which we had never investigated before. We chose to run equipment on this floor during the event because of the major renovations that have taken place over the last six months. Whenever buildings are renovated or major changes have taken place recently we have found that it can stir up paranormal activity. In the video below, after I ask 'are there any children here?' at 0:06 you hear voice from our ITC device say 'yes'. One of the methods that we use while doing EVP work is to also use trigger objects in the hopes that spirits will recognize the items and move or manipulate them in some way. Often we will be recording video in the hopes of getting any changes on video to share with the public. One common trigger object method is known as light source communication. Investigators will set a flashlight such as a mag light down and ask for spirits to turn it off or turn it on as a yes/no method of answering our questions. Both Darcy's group as well as Bobbie and Ryan's group were successful in using this method to communicate with spirits while at the museum. The video below was recorded by Bobbie and Ryan's group. Throughout the evening guests also used the K2 meter as a light source communication method to ask simple yes or no type questions. With this meter investigators can ask spirits or spiritual energy to move towards the meter, which will cause the lights on the meter to come on in succession. The two videos below are an example of guests using this method at the museum. Members of Paranormal Investigations Nova Scotia had a great time at the event, and all of the guests that attended told us that they also enjoyed it a great deal and would definitely come back for future events. We are looking forward to hosting events at the Colchester Historeum in the future, especially Halloween events this fall! If you're in the downtown area of Truro, a stop at the museum to admire the renovations and the buildings history is definitely recommended. Let us know if you encounter any of the buildings ghostly inhabitants! During the late summer of 2015 I was approached on our Facebook group Haunted Nova Scotia by a staff member of the Veith house, who was interested in gaining publicity for a ghost walk that they gave at the building close to Halloween. At this point in time our team had hosted in several successful fundraising events and I was eager to visit a new building an start planning for another event. We planned to meet and have our team investigate the building for an evening to see what evidence we got, and to get a rough idea on how many guests an event at Veith could accommodate. Leading up to our investigation of Veith house I began researching the background of the building, and immediately noted that there were several ghost stories shared about the building, and that it had every right to be haunted. The present building pictured above was built to replace the original building that was known as the Halifax Protestant Orphanage. In 1914 when the Great War began, men living in Halifax began to leave the city to fight in the war with the British Commonwealth. At this time it was common for children to be signed into an orphanage until their father returned home from war. The original orphanage was destroyed by at the catastrophic Halifax Explosion of 1917. It is said that the matron of the orphanage heard the first sounds of panic that heralded the larger blast, and ushered the children and staff members to the buildings sub level, fearing that the city was under attack. All but six were killed in the explosion, an explosion that was the largest recorded man made explosion prior to the detonation of nuclear weapons. Over 2,000 people in Halifax and Dartmouth were killed, and another 9,000 people were injured. A memorial plaque was placed at the site of the original building in the year of 2000, just down the street from the current building. During WW2 many families were again separated as the men left for war, and children were again signed into orphanages until their fathers returned home. Orphanages are rarely places of happiness, and Veith house was no exception to this. The matrons were given very little training by the superintendent of the orphanage, which meant that discipline and punishment were left up to each individual matron. As a result, cruelty and abuse did happen frequently. When children would be signed in to the orphanage they would be assigned a fourteen day stay in the isolation room, which the children referred to as the horror room. They would be in this tiny room for the duration of two weeks to ensure they had no head lice, illness, and that they had been given new clothes if needed. Often there would be four or five children in this room at any given time, a room that is no bigger than a spare bedroom. There were beds and a slop bucket and that was as far as the amenities stretched. One example of a punishment at the orphanage was being restrained in your bed at night if you were caught roaming the building after lights out. The children would be put into a jacket that buttoned in the back, with straps that the matrons tied to the frame of the bed. The child would lay on their back, unable to switch positions or move until morning. If the child happened to wet the bed when they were restrained, further punishment would be given. While the staff and our team know that there are several spirits attached to the building, there is a famous one, the spirit of a small boy named Harvey. A photographer captured a photo of what looks like a young boy playing in the building, and during our initial investigation of the building we recorded evidence that supported the presence of a spirit named Harvey. During a visit to the building a medium informed the staff members that there were also the spirits of children residing in the basement, and that she felt a gift should be placed down there to please them. A small Christmas tree was placed and decorated, and stands down in the sub basement year round. After getting a tour of the building we split into two separate groups and began our baseline readings and full investigation. My group started in the sub basement, which consists of a long hallway and two rooms, one of which the Christmas tree is in and is mainly used for storage. Before we began an EVP session beside the tree I set up a Canon rebel with a laser grid attached to it in the adjacent room. The laser grid covers the area in small green dots, which instantly detect movement if something moves through the beams. In this video clip below, you can see the grid is pulsing slightly, which is very odd. In the other room, you can hear Darcy ask if the spirit needs us to help them. at the 0:10 mark you can clearly hear a male voice that belongs to neither Darcy or I say 'help' in the room with the Rebel. Just before this happened the audio on the Rebel also picked up what sounded like light shuffling footsteps, as if a child came in the room. We often leave objects around that a spirit might identify and interact with, known as trigger objects. In the audio file below we are discussing a flashlight that we had used as a trigger object. When we weren't looking, the flashlight had moved slightly and now had a power cord from a nearby television wrapped around it. At 0:14 you hear a female say 'it was me' from our ITC device. Shortly after this audio clip was recorded, we switched areas of the building and began baseline readings of the top floor, and decided to investigate the Remembrance Room, a small room that houses several items from the first orphanage as well as reading material and framed photographs of the Veith House. In the video clip below our group heard my name called from our ITC device at the 0:08 mark. At 0:22 after asking if the spirit is the young boy named Harvey our flashlight turns on. At 0:34 after asking it to shut off the flashlight the flashlight turns off. This is a technique known as light source communication. As we continued to investigate the top floor, I again asked if a spirit in the room could tell me their name. At 0:13 of the clip below I asked if the light turning on was a positive answer to letting us know who we were communicating with. at 0:33 after asking if it would speak into our ITC device we recorded a female voice saying 'Tina' twice. As the investigation went on, we were discovering that more and more spirits were interacting with our equipment and data. Before we concluded our investigation, we recorded an irate male voice telling us to 'get out' the EVP clip is at 0:09 of the video below. During both our investigation and our public event that we held with twenty guests the activity picked up throughout the evening as we continued to investigate. Several of the guests felt that there was something quite nasty in the sub basement, particularly in the room that we had our Canon Rebel and laser grid set up. The Veith House is a location that we will definitely be returning to for future investigations and events. I remember reading about the Mary Ellen Spook farm at a very young age, most likely in one of the books written by Helen Creighton. It instantly captured my imagination, and has always stuck out as one of my favorite ghost stories from Nova Scotia. Because of my interest (obsession might be a better word to use) in local folklore and stories, I never forgot the story of the spook farm and the feelings of unease that the stories caused. Before I go any farther I do need to point out that I have spoken with the current owner of the land this summer, and he doesn't want any people going out to this site any more. the last time that I visited the site the portion of the trail that was accessible by four wheel drive was littered with garbage and signs of partying. In another year or two the forest will have completely reclaimed the road and it will be next to impossible to find and very easy to get lost. To even reach where the driveway once stood you have to drive a fair distance into the countryside outside of Antigonish. What happened to the family living at the farm in 1922 will never be known. There are countless theories and ideas, stories and facts. Because the story has been told and retold many times over, I think that a lot of the facts surrounding what happened have been lost to time. Two things remain certain however - something happened to cause a family to flee their home in the dead of winter, and whatever that something was still has a great many people in the community and surrounding area very nervous. 'Fire Spook' by Monica Graham is a very good book to purchase if you want to read about the case, case notes, and view photos of the family and all of the investigators that took part in trying to unravel the mystery that the family was going through. For my part, I will stick to the stories that have been sent to me by locals as well as my own experiences. When I finally did get to visit the spook farm for myself, I was thrilled beyond words. This was a location that I had read about for years, had watched the Creepy Canada episode, and had scoured blogs and webpages reading the accounts of people who had also been drawn to the Spook Farm to see it for themselves. I was also hit by how isolated the farm site is. When you stand by the foundation and look around, you can still make out where the new growth trees stop and the old growth begins, signs of where the fields and pastures had been. Looking at this, it was very easy to imagine how isolated the family was when their ordeal began. One odd thing did happen when we were hiking back out to our car. I thought I heard something in the woods off to my left, and stopped to listen carefully before continuing. The investigator I had with me continued up the trail, and I stood watching her in amusement wondering when she would notice that I was no longer with her. As I called out to her, she wheeled with a look of shock and fear on her face. I jogged up the trail to her, and she told me that for the last couple of minutes she could feel someone walking behind her, literally breathing down her neck. She even described how she could feel breath on her neck, and when I called to her she was already turning to ask me if I could possibly get any closer to her. The look of shock on her face came from seeing how far away I was, and realizing there was no way what she had experienced was me playing a prank. Locals don't like this place - in fact while discussing it with several of them, it became clear that they were afraid of it. Many of them admitted that they would not drive past the road leading to it at night, and if they were walking by it during the daytime they would switch to the other side of the road until they were well past it. Many of the stories are of people going to the farm and taking pieces of the roof, support beams, and other household items as souvenirs only to have a fire start in their home shortly after. There is no longer any part of the farmstead left other than the foundation of the house and barn, and even these landmarks will be impossible to find in a year or two. I have also been told several stories from locals who have had their car die on them close to the road, with no clear explanation. Other people have talked about seeing a large black dog rushing at them, only to vanish as suddenly as it came. Still other people have seen the dog on their way back from the farm, dashing between the trees and watching them. Is the location still haunted? I haven't decided yet, but it wouldn't surprise me. Something definitely happened here that defies explanation, and it drew investigators and skeptics from different corners of North America. It still has locals spooked, people who would rather forget about the Spook Farm and let the forest reclaim the farmland. The Fortress of Louisbourg, as seen from the access road leading to the staff entrance to the fortress. The fortress is without a doubt one of my favorite haunted locations to visit, whether it is a weekend trip or a day trip for meetings to plan investigations and events. The fortress is the largest reconstruction project in North America. The original settlementwas founded by the French in 1713 and quickly became a bustling center for fishing and trade. In 1744 however Britain and France went to war, and Louisbourg was attacked and conquered in 1745. After their loss to the British the French townspeople who had built Louisbourg were exiled back to France and four the next four years Louisbourg became a British garrison town. In 1748 the terms of the Anglo-French truce allowed the French townspeople to return to Louisbourg in the following year of 1749. Almost immediately the trade and fishing returned in earnest, and the townspeople began to prosper again. It was not to last however as the short lived truce lasted a short time. In 1758 there was another siege, and the town and fortress were captured again, with the French townspeople again exiled to France. In 1760 the British had the fortifications destroyed, and the rest of the fortress crumbled over time. The fortress is now a bustling tourist attraction, with hundreds of people touring it every day during the busy summer season. Parks Canada staff as well as The Fortress Association and period actors make sure that visitors truly get a historic experience when they visit the fortress. Because of the believable period actors on site common ghost stories from tourists are of following someone they thought to be a staff member, only to have the person vanish almost in front of them. A period actor in the Artillery Forge - photo taken by Tari Anne Kareidis, a member of our Facebook group Haunted Nova Scotia and frequent contributor. This will be our teams third year of investigating at the fortress of Louisbourg. We will be investigating the fortress as a private team the first night this year, and then hosting public ghost hunt events the next two nights so that members of the public can investigate and experience the fortress. To be able to explore the fortress in the evening and at night is an incredible experience - there are always different buildings and areas to explore and investigate, in which we have gotten some of our best evidence to date. The guard at the Dauphin Gate - photograph taken by Tari Anne Kareidis, a member of our Facebook group Haunted Nova Scotia and frequent contributor. One of the best audio clips that we have gotten at this location was recorded in the Kings Bastion chapel. It is under this building that the remains of several bodies still lie to this day. Amanda was operating an ITC session using a digital recorded and an SB7 spirit box. As she walked through the chapel she began asking questions such as 'are you a soldier' 'when did you die' 'how did you die.' the response she got is embedded below and at 0:03 seconds you can hear a male voice respond 'we all were shot.' The SP7 was scanning in reverse at such a high rate of speed that it is impossible that this was radio clutter from a station in Sydney. We have recorded responses and voices in both English and in French, and have had countless odd occurrences that we wouldn't explain. We have heard a woman crying in the upstairs area of the bakery, and have heard voices in buildings that were locked and empty. There is a staircase in the barracks that on one occasion made several members of our team (myself included) very uneasy as well as our guests when they were in the area the following night. The image below is of the staircase. The video below was shot by Kim and Dana in the Chapel the first year that we investigated the fortress. While they were beginning their investigation of the room, Dana's flashlight started acting up at the same time that he started noticing EMF levels in the room were slowly rising.. When Kim came over to check the flashlight that she had left on a railing behind her suddenly turned on by itself. During our visit to the fortress the second year Dana and Kim were in the barracks near the staircase that made several team members as well as guests uneasy. As they set up their equipment both of them began to feel watched, like someone else was in that area of the barracks with them. As they discuss this, at 1:45 of the clip embedded below you will see the flashlight turn on by itself while at the same time the K2 meter beside it lights into the orange and briefly into the red. This combination of evidence leads us to believe that something emitting an energy level interacted with the flashlight to communicate with the two investigators. These audio and video clips are just a few of the examples that we have recorded while investigating at the fortress. We will be returning this summer to do two events, so if you would like to join us at the fortress I will be updating Haunted Nova Scotia as well as the blog and events section of the webpage as to what dates we will be hosting them! The Five Fishermen eatery in Halifax. Photograph provided by Katie Conklin of Destination Halifax. The Five Fishermen is one of the most well known haunted locations in not just Halifax but all of Canada. Whenever you come across articles such as 'top ten haunted places in Canada' The Five Fishermen is guaranteed to be on that list. In the fall of 2014 I received a message from Suzette Belliveau of CTV wondering if our group would be interested in working on a Halloween episode for CTV news, a two part episode that would air just before October 31. I instantly accepted, and Suzette and I began brainstorming places that we could shoot an episode that would capture the imaginations and interest of viewers. Shortly after our initial conversation she messaged me to let me know that the general manager of the Five Fishermen was interested and excited to allow us to shoot our episode at her location. Our team was extremely eager for the opportunity, as we would be the first paranormal group to visit the location for a formal investigation. The building at 1740 Argyle street was constructed in 1817, with plans for the building to be a schoolhouse. The schoolhouse doors opened the following year, where classes were held for several years. The building then changed hands and the new proprietor changed the school over to an art school, known as the Halifax Victorian School of Art. The art school prospered for a few years, before moving to a new location in the city. It is at this point that the Snow family became the proprietors, and the building was renovated to serve as the Snow Families mortuary and funeral home. John Snow & Co. funeral home would play significant roles in two of the worst disasters in Canadian history. In 1912 when the Titanic sank off of the coast of Newfoundland many of the bodies recovered were brought to Snows Funeral home for proper arrangements of the bodies to be planned. Two of the bodies that were brought to the building were John Jacob Astor IV who was the richest man on the ship, and Charles M Hayes, the president of Grand Trunk Railway. In December of 1917 the Halifax Explosion claimed over 2000 lives and decimated a large part of the city. In the aftermath of this tragic disaster Snows funeral home played a part in storing the remains of victims as well as preparing their arrangements. It is no wonder that the building is haunted, with all of the negative emotion and energy that it has seen over the years. Staff members to this day report seeing both male and female apparitions in the building, experience walking through brief pockets of extremely cold air, and of hearing crashes and bangs from the kitchen as they were closing the restaurant for the night. Upon investigating they found utensils and pots and pans had been tossed around the room and knocked over. During our investigation, a staff member told us that one of the more disturbing rumours is that the ladies washroom had been the scene of several exorcisms. I could not find any solid evidence or stories to back this claim, but I can say that the washroom is very oppressive and you feel unwell while you are in there. Several staff members and patrons have reported hearing a woman sobbing in the stall next to them. After knocking on the stall door and glancing under the door, they were shocked to learn the stall was in fact empty. Two of our members set up equipment while we were investigating in attempts to record evidence throughout the night. The female washroom at The Five Fishermen. This is a room that has been the site of supposed exorcisms, and it is a room that many patrons complain about not feeling very comfortable in. Photo provided by Tari Anne Kareidis, an active member of our Facebook group Haunted Nova Scotia. Another area that we set up equipment and began investigating is the wine cage that is located close to the main dining area. If you look at the wine cage area, you will see that the pulley system is still in place from the buildings funeral home days. This is the area that they would raise and lower the caskets via the pulley system. The wine cage area. Our team recorded a fair amount of relevant EVP and ITC clips in this area. Photograph was taken by Tari Anne Kareidis, an active member of our Facebook group Haunted Nova Scotia. One of the highlights of our investigation was discovered after I reviewed evidence that Suzette Belliveau and Darcy O'Neil were conducted an ITC session at a dining room table. During their first attempts to communicate with a spirit they both heard a male voice trying to come through. Darcy asks if a male spirit is present an wanting to communicate with the. In the clip below after Darcy asks this at 0:15 a male voice says 'it's drake'. What makes this clip relevant and fascinating is that after Suzette researched in the Halifax archives she discovered William Drake was a 20 year old man living in Halifax when he was killed in the Halifax Explosion. His remains were sent to Snows Funeral Home to be prepared for burial. Hos body would have been worked on no more than ten feet from where Darcy and Suzette were sitting when they recorded this. As with all our audio I would recommend headphones while listening to this clip. It's always amazing to not only get evidence, but to be able to back it up by researching in archives to find out if the evidence or answer that you received was indeed a valid answer. In another part of the building we set up a REM pod to register EMF fields interfering with the device. The area that we set this device up on is well know by the staff as being an active area. Items being knocked over and thrown, including ashtrays have been reported here. When the device started to go off and registering a strong EMF manipulation around it we also recorded a shadow at 0:40 moving over the device and then back down again quickly. The video is attached below. During our stay here we continued to receive and record evidence. It was a complete privilege to be able to investigate this historic and iconic location, and our team hopes to return for another investigation as well as a public event in the future. If you're in the area, definitely check out The Five Fishermen. The Resto Urban Dining eatery in Bedford has a long running history of being one of the more haunted restaurants in the HRM area. Before the current owners began operating the eatery it was known as The Cellar. Over the years the building has been investigated by different paranormal groups and was featured in the Canadian television show Creepy Canada. A common piece of information that was shared with us by staff at Resto Urban is that while they believe their building is haunted by several spirits, the main spirit that has remained there over the years is the spirit of a woman named Elizabeth. There are several different theories on who this woman was and why she remains on the property, with no easy answers regarding whether or not any of them are true. In September of 2015 I was contacted by Bree Doubleday, an employee of Resto Urban Dining and a frequent contributor to discussions on our Facebook group Haunted Nova Scotia. Over the course of chatting with her she provided several different occasions when something had happened that she or other employees couldn't explain, and also informed me that the group who had investigated previously also recorded evidence during their investigation. I was given the contact information for the owner of the restaurant, who was eager to welcome us for an investigation. We set an investigation date for the evening of September 6 at 9:00 PM. A portion of our gear in a private dining room of Resto Urban shortly after arriving on site and getting a tour of the building. The first thing that I noticed upon arriving was how beautiful the building is. One of the owners as well as Bree and another staff member were very open and welcoming, and gave us a tour of the building as well as some of the paranormal history of the building. While the building felt warm and inviting, the basement areas definitely felt different. It is in these small rooms that members of the staff often feel uneasy and watched. We decided to split into two different groups, with various cameras recording in different parts of the building. One of the first cameras that I set up was an infrared camcorder in the basement, angled to cover the majority of the basement. It is this camcorder along with a Sony video camera that recorded most of the evidence throughout the evening. After this video was recorded in the basement, we decided to switch rooms in the basement and move to a room that several people have felt uncomfortable in. As you can see from the video I had left the camera quite low as we were setting up for another EVP and ITC session. During each investigation we go on we introduce ourselves by name in the hopes of recording something calling our name during the investigation. At 0:07 seconds of the following video you hear the same voice come through our ITC device and call 'Stephanie.' Immediately after this you can hear her tell other investigators that she thought she had heard her name called. As we continued investigating the building we were still getting relevant responses and evidence recorded on our devices. Towards the end of the evening I wanted to determine if there was indeed the spirit of a woman named Elizabeth in the building. Before we left the basement area for the night I began asking the spirits for a name. In the clip below I ask what letter their name started with and if her name was Elizabeth. At the 0:04 mark of the video you can hear a female voice call out 'yes' from our ITC device. These are the main pieces of evidence that we received during our investigation at Resto Urban. Along with the evidence shown we continued to have odd occurrences happen all night. Our team firmly believe that the building is haunted, and we look forward to a chance to return to the restaurant for a second investigation. Thank you to the owners and staff for being such great company during the investigation! The Colchester Historeum is one of our favorite locations to host events and fundraising events at. It's also the first public location that gave us their approval to investigate as a team, and we collect great evidence every time that we visit the building. The historeum was built in 1900 to serve as the science building for teachers in training at the Provincial Normal School. Students studied here until 1961, when the building was mainly used by the local schools for industrial arts classes. In 1976 the building became the Colchester County museum, now named the Colchester Historeum. This building is very well known as one of the most haunted in Truro. The story that you will most likely here of is the story of a workman being so badly frightened by something that he saw that he fell off of the scaffolding he was working on. The story goes that he glanced up from his work to see the apparition of a woman staring back at him from inside the building. When they investigated the room that he saw the apparition they were shocked to see that the window was covered over from the inside, and had been for some time. There is no way that the workman could have seen anybody inside the room from where he stood. Past curators of the building have also believed that the Historeum is haunted. One such person was constantly losing her scissors while she was employed there, to such a degree that she was convinced someone was playing a prank on her. The buildings elevator will move between floors of the building on it's own. It's very common to walk past the elevator and have the doors open, or to walk through the building and hear the elevator stopping and starting with nobody around to operate it. We will be hosting events here this year, and are very eager for the new curator to take part to see if she thinks the building is haunted. The recent renovations to the building are absolutely amazing, and it's worth a visit just to admire the work that has gone into the main area of the building over the past 12 months! Every paranormal group has that one certain spot that they always return to, because they always get evidence when they investigate them. For our group this location is one of our favorites, and it is also a location that we take new investigators to train them using our methods and all of our equipment. Along with it being an absolutely gorgeous location, it is also an area that locals have told ghost tales about for generations. The more common stories about this cemetery are the sightings of shadow people being spotted, and even stories of a large black dog running through the cemetery at people walking by on the road below, only to vanish as it got to the boundaries of the cemetery. We have recorded very clear EVP's and video clips at this location. One of our members took a photo inside the church before she exited, and in the photo she took you can see the shadowy silhouette of a person sitting in one of the rear pews, as if listening to a sermon. As the website grows, I will work on getting our audio and video evidence linked to each individual blog post so that everyone can listen/view them here, rather than switching to another website. Our audio clips are all stored on another site for the time being, and we are planning on filming each investigation for YouTube for our 2016 season.